Understanding publicness as an emergent, exceptional condition of the built environment instigated by the dynamic relationships between various ‘actors’ (living and constructed) in space, students were asked to represent the spatial and temporal conditions of specific occurrences through a detailed drawing series in order to produce a composite image. The occurrences depicted by students included urban marketplaces, playgrounds, theaters, unrealized speculations, protest events, and art installations. Architectures of exception range between two typological extremes: monument and camp. While the monument imparts exception by its iconism, singularity, and permanence, the camp operates as a framework – systematic, adaptive, transient. In this assignment, students were asked to create two representations of the same building: as monument, and as camp. Each image was intended to read strongly as either one or the other. 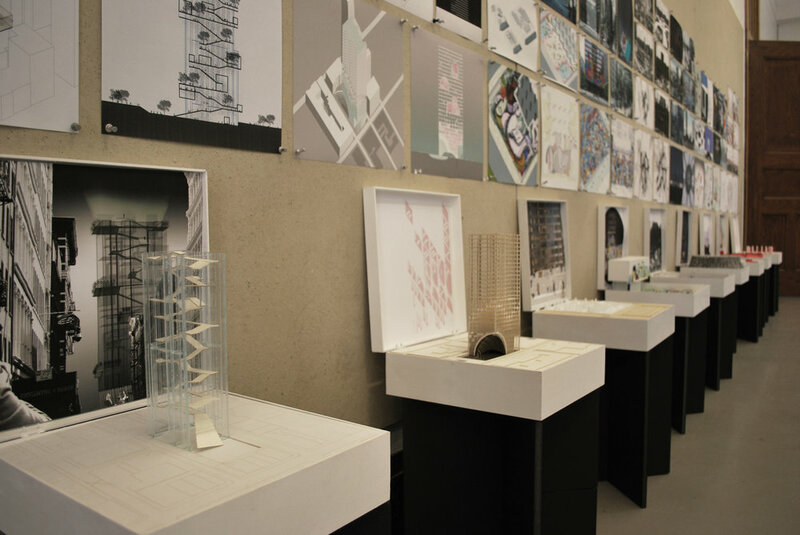 Beginning with a given monumental site in New York City, students were asked to propose a spatial intervention which forms a new Space of Exception, or critical deviation from the existing conditions and contextual norms. The original sites already exhibit unique qualities of monumentality, yet each is uniquely problematic within its context. This monumentality -- be it formal, programmatic, symbolic etc. – already imposes a condition of exception on its surroundings. However, it also suggests a static and unchanging nature of the built environment, rather than promoting dynamism, pluralism, and productive agonism. Therefore, students were asked to deploy the strategies of Camp to adapt the Monument. The notion of exception offers a critical, untapped potential for architecture. As an intervention within a context, an exception produces a strategic deviation (formal, political, social or otherwise), introducing transformative shifts within existing conditions which resist a status quo. As the increasing uncertainty of our time spurs a recoiling towards impossible absolutes - fostering scarce middle ground between regressive stagnation and rapid, shortsighted development that exceeds the pace of critical practice - exception offers a strategy for intervention within these circumstances. Against the vast, neutral homogeneity of the constructed environment, the exception acts as an architectural form of resistance. If a space of exception is understood as the imposed distinction from and within a context in order to support difference and encourage change, it is in the interest of architects to explore strategies for its implementation within the built environment. Existing typologies that perform as spaces of exception range between two seemingly opposite poles: the Monument and the Camp. A Monument is typically thought of as an object charged with symbolism and meaning that is formally or spatially distinguished from its immediate context. By contrast, the Camp is a bounded territory with distinct internal organizational logics and operational behaviors. If the monument is symbolic of permanence and timelessness, the camp is ephemeral, emergent, and typically occurs in response to timely conditions (i.e. event, disaster, warfare, etc.). Yet a closer consideration of these typologies begins to blur these temporal distinctions. This course sought to establish a discourse around the potential of exception for architecture, with a focus on critical analysis and visual and physical representation as modes of operation.